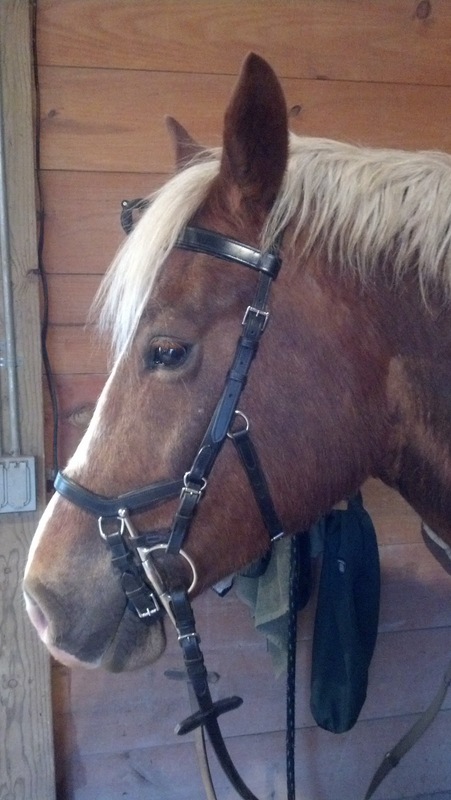 Cob Jockey: Micklem Competition Bridle REVIEW! Looking Cobbier all the time. 1. Husband of the Year told me that if I sold a spare set of brand new wheels and snow tires that came with his car on Craigslist, I could use the proceeds for horse stuff. At the same time, a used/like new Micklem finally came up for sale at a reasonable price, and I jumped on it. 2. Attendant to #1, with the Craigslist money, I also bought a used Thinline Saddle Fitter pad with both sets of shims, partially because I’ve wanted a half-pad and partially because I see saddle fit problems on the horizon with my jump saddle. Sigh. 3. Connor freakin loves the items in #1 and #2. 4. Jumping is hard (for me, not him), and we’re doing more of it. 5. Real Dressage is hard, and we’re doing more of it. 6. We have a debut event picked out, and it’s big. Today will be Micklem review day. You guys know I've been enamored with them for a very long time, but they almost never come up for sale used, and when they do sell used, they sell for nearly as much as they do new. This one came up for sale on the High Quality Used Tack Facebook store for a great price, and I highly recommend working with them. I saw it on my phone, messaged her about it, received a PayPal invoice, paid, and had it shipped all within a matter of minutes while I was in Nappanee last week. Two thumbs up for service from them! Going to have to keep the goat beard in check with this bridle. Connor has spoken about his preference for the Micklem: he loves it. 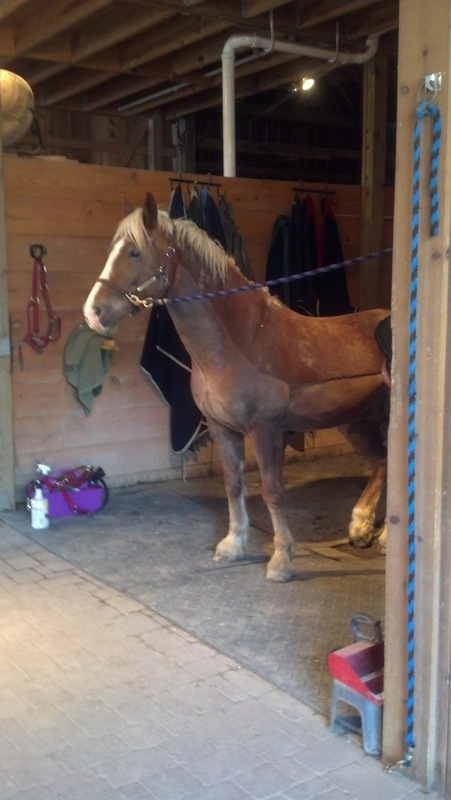 From the moment I took up the reins, he was mouthing the bit a lot, which has never happened before. It was like his default reaction became to push into the bridle and seek the bit rather than put his head up and hollow out. He got heavy a few times, but I could tell that laying on my hands wasn’t the easy escape that it normally is for him, which he got frustrated about for a few minutes and before deciding to carry his own head the rest of the ride – YAY! He was SO light in the reins compared to normal, and really working over his back with minimal effort from me. I cannot overstate what a big change that is from ride to ride, it's a 100% turnaround from my last ride on Tuesday, in which I could not get him both off my hands and working through his back at the same time. It was amazing. Our contact was more consistent and stable, and my half-halts felt much more effective than normal: I got big reactions every time I asked. I can’t see going back to riding in a regular caveson with him after feeling that, which is a shame, because I love the way Heidi’s bridle looks on him, the photos from the Hoosier Horse Fair make it clear what a good looking noseband it is on him. Though the Micklem does flatter his head also, aside from making his hairy jaw very apparent. So my final verdict on the Micklem is that it worked miracles for Connor and I. I felt like I bought a different horse when I just made a tack change. My biceps didn't ache after my ride yesterday - love it! I recently bought a Micklem and also love it and how my horse performs in it. Unfortunately, my baby really likes to be able to move his jaw, and I find the Micklem restricts this a bit too much. So, for dressage I have to go with a regular snaffle bridle. The Micklem is wonderful for jumping though! I feel you with the regular noseband. I think Bobby looks soo much better in a normal bridle, but he goes so well in the Micklem. Thank you for the Micklem review. My future cob is going to have one. :) Connor looks very cute in his. Hawk, I didn't think of that before, but I can see them feeling like the lower jaw is restricted with the unusual placement of the straps. That's something I will pay attention to with Connor, though he's more in the "I will set my jaw where I want and leave it there thank you very much" camp than the jaw-moving camp. Carly, have you always had him in one? I noticed in a lot of your pictures he's wearing it. Thanks, Alanna! I am seriously counting down the days/months/years until you get yours! Also, I mentioned you to Connor's breeder and she said she would LOVE to chat bloodlines with you if you're interested when you go to buy/breed! She knows a lot of the upper West coast Cob people from the WPCSA convention being in Oregon the past two years. 1-6, Those are lots of good things! Jen, does it have the option of going behind the bit instead of in front? Just wondering. I like the concept, but would prefer not having a drop noseband. I agree with Hawk about the restriction. I am glad he likes it. With Barry a flash helped me keep a more consistent contact and there by helped with our connection. What size did you get? These Cob heads are hard to fit. That looks like its fits well. Love the list. Glad that you love the bridle. I am interested to see how it fit your guy. I have thought about getting Mystic one for jumping but have read reviews that say it can be somewhat hard to fit. Then thinking about trying to fit it to Mystic has steered me away so far. I'm delighted you finally got one - I know you've wanted one for ages! 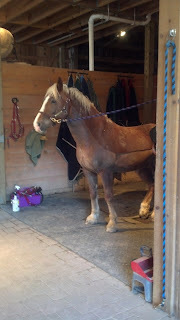 It's interesting that you had no issues fitting, I had trouble with both of mine - if the noseband was high enough not to be pressing on the fragile bones at the end of the nose, then the straps for connecting the bit were too short. Also, I found the jowl strap only just long enough. What size did you buy? To Hawk and anyone else worried about the "drop noseband" effect, I would say that you can do it up pretty loose - I make sure that can easily fit a finger under the noseband in the chin groove & both my horses can mouth & chew easily. That was the biggest difference I saw with Aero the first time I tried it - he produced a bit of foam at the mouth for the first time in ages. Thanks for chiming in, you liking Aero's was definitely a factor in my purchasing one. In a normal bridle, he is horse-sized in the browband/headstall, and cob-sized in the noseband/cheekpieces, so I went with small-horse size. The only adjustments I fiddled with were exactly as you described, getting the noseband/bit placement right. I think it depends on the size of rings your bit has; my full cheek snaffle with its small rings that I have him in now was a pretty easy fit, while I think my loose ring, should I ever go back to it, will be a more difficult case to fit. I also have the noseband very loose, especially since I don't think Connor has ever gone in anything but a plain caveson before.